Liking to bicycle ride does not necessarily mean you like higher taxes, higher spending and slower economic growth. Slower growth means less jobs. The cost is too high for the "let's all sell our cars and walk everywhere" philosophy. Less travel means each person has fewer options for jobs. Walking - a job more than 3 miles away is not an option. Cycling - depending on terrain and safe routes, jobs more than 5 to 15 miles away are not an option, except for athletic 20- and 30-somethings or during the summer. I like people to have jobs, so I am very leery of more spending for Ron Sims and his limo. And he requires higher taxes, then higher and higher. There is no limit. Sound Transit is a fraud. They promised a system and the timeline to build it. We would have been touring the Rainier Valley by rail last year on their promises. BUT They shortened the system and lengthened the deadline. Now they claim they are on-time and within budget. That's not true. I don't want their taxes continued indefinitely for more of the same. No on Sound Transit #1 I drive to work 2 to 3 days a week, carpooling about one of those. Washington transportation has spent tons of money on environmental impacts and such. I don't have the exact numbers, but the nickel increase a few years ago had something like 30% or more going for environmental impacts. But how about congestion? Congestion was not a priority. Oh, they changed the wording last year, but not the priority. They want congestion to force us out of our cars, to be standing on the street hoping a bus will come. But not them. Mayor Greg Nickels drives his limo 100 miles a day seven days a week. (Stefan Sharkansky at Sound Politics discovered and documented this.) They can drive, but you can't. Yes on I-985. It's not how I would do it. But I favor an attempt to overturn the priorities and put reducing congestion on top. If the legislature doesn't like Tim Eyman setting the priorities then they have to lead. They had their chances to decrease congestion AND to make it better for walkers and cyclists. But they chose to favor rail and buses to a lesser degree. My recommendations. Top priorities are in bold. Except for president and governor they are in the order in the voters pamphlet. Two updates are marked. President: John McCain - he has commanded a Navy flying squadron and been 100% against wasteful and special-interest spending. Governor: Dino Rossi - he worked across the aisle and built a balanced budget. His opponent broke it and continues to. Initiative 985 - For - It's not how I would do it. But it makes congestion improvement the top priority. A foreign idea to the power establishment. Initiative 1000 - Against - It's not "death with dignity," but playing God. It has no safeguards and requires doctors to falsify death certificate. There is no protection against coercion or financial pressure. I-1029 - Against - This is the SEIU - Service Employees International Untion - forcing thousands of low-paid private workers into their government-employees union. Ignore the quality claims; it's a smoke screen. Update And the training stuff sounds good until you realize it might require YOU to be certified to take care of your own mother and/or father. Congress - 7th district - Steve Beren - Jim McDermott is a fossil who only gets attention when he betrays our country. No accomplishments in 20 years except to destroy the House Ethics committee by lying while a member of it. State Lt. Governor - no preference - Brad Owen is a Democrat whose priorities make Republicans happy. Secretary of State - Write in Stefan Sharkansky - Sam Reed embarrasses us. After the 2004 fiasco he did some to make things better, but more to make them worse. Update Treasurer - Allan Martin - He is endorsed by his predecessor from the opposite political party. Auditor - Bryan Sontag - Another Democrat who make Republicans happy. Attorney General - Rob McKenna - doing a great job. Comm. Public Lands - Doug Sutherland - No one pays attention to this office. But his opponent is endorsed by the bigger government people. Superintendent of Public Instruction - Randy Dorn - His opponent created the WASL and flew it into the ground. Insurance Commissioner - John Adams - His opponent is a long-time politician who saw an open job. 32d District Position 1 - Alex Rion - A libertarian who can explain smaller government, limited spending and taxing. He fled Michigan which caused its own one-state recession with its high taxes and miserable leadership. Position 2 - uncontested - Ruth Kagi is a long-time acquaintance. Judges King Superior Court position 1 - Suzanne Parisien King County Charter Amendment # 1 - Yes - to elect the director of elections " #2 - No - just adds more privileged classes. It even requires three terms for homosexuality. " #3 - Yes "#4 - No - Let the voters decide if candidates are qualified for the office they seek. " #5 - Yes " #6 - Yes King County Charter Amendment #7 - No - Makes it impossible to qualify an initiative. The politicians detest initiatives! " #8 - No - Pretending to be nonpartisan doesn't make you so. Sound Transit #1 - No - Another multi-billion dollar boondoggle. Sound Transit is lying when they say the system under construction is on time and within budget. They had to approve a later deadline and a higher budget, so it could "comply," i.e., appear to comply. Update: A transparent attempt to prevent Dino Rossi from campaigning. Demo lawyers and a judge tied him up for 5 hours yesterday to make a deposition in someone else's law suit. Read about it. And remember King County Superior Court Judge Paris Kallas when she runs for reelection. She made this travesty happen. Ear's to planet Vulcan being real | The Daily Telegraph: THE home planet of big-eared Star Trek legend Dr Spock could actually exist. Experts reckon up to eight worlds could revolve around the star Epsilon Eridani, which Spock's [fictional] planet Vulcan orbits in the cult TV series. Epsilon Eridani is surrounded by two bands of rocky and metal fragments like the asteroid belt that lies beyond Mars in our solar system. And Nasa experts believe if they are there, rocky planets like Earth must be there too. [More planets are giant gas balls like Jupiter and all of Earth's planets past Mars.] It boosts the chance that this new solar system could be inhabited. Nasa expert Marc Kuchner told Britain's The Sun newspaper: "I wouldn’t be surprised if seven or eight planets orbit Epsilon Eridani. One of these could be habitable." The Muslims say Obama is one of them. New York Post: OBAMA! Inshallah!" - Obama! Allah willing! That slogan, scribbled on walls in Gaza, indicates the hopes that Barack Obama has inspired among Arabs. While Obama has tried to push his origins into the background, his "Islamic roots" have won him a place in many Arabs' hearts. One columnist, Mohamed Al-Menshawi, hails Obama as "the candidate with Muslim roots" and as the "harbinger of solidarity between Americans and the Muslim world." Another, Al-Jazeera's Aala al-Bayoumi, notes: "Had it not been for Obama, Arabs would not even bother to follow the US presidential race." What makes the difference is Obama's "Islamic and African roots." The Boeing 707 shrunk the world in 1958. Its first commercial service was a flight from Idylwild Field (now JFK) in New York City to London on October 26. The flight was a big deal. The 112 passengers were feted in a reception before the flight and were escorted to the plane by stewardesses under spotlights. Before jet service flying between the US and Europe was a 12-hour ordeal. There were stops in Newfoundland, Iceland and Ireland. The aircraft were noisy and vibrated. And they flew at lower levels in the weather. So passengers bundled up with blankets and ear plugs. Instead the trip was 7 hours of quiet comfort. (The first commercial jets had noisier engines that were replaced in a few years by quieter "fan jets".) I was surprised to discover that the inaugural flight had to make a stop at Gander, Newfoundland, due to high winds, so it took 8 hours 30 minutes, rather than the much acclaimed 7 hours. It probably came down to the choice of removing 6 to 10 passengers - looks very bad - versus arriving late. [I found this on an internal Boeing Company web page, but can't find it on the public internet.] The 707 was the airplane that changed the world, but it was not the first in commercial service. The British Comet beat Boeing by several years. But it had a truely fatal flaw. In 3 years four of them crashed. It was discovered that the square-cut windows made a point for metal fatigue to start a crack. The cracks led to structural failure and the fatal crashes. The Comet was reintroduced on October 4, 3 weeks ahead of the 707, but its reputation never recovered from the fatal crashes and it failed in the market. It was also much smaller, carrying only 80 passengers versus 112. Our daughter, son-in-law and two grandchildren live 3,000 miles away in Charlottesville, VA. But almost every time Grandma - my lovely wife - complains about the distance, the response is "but Charlottesville is beautiful." And it is. Beautiful, historic and interesting. The New York Times visited and did "a weekend in..."
ARRIVING in Charlottesville from the lush, rural Virginia countryside, you almost feel like you've stepped back into ancient Rome. The Rotunda, the centerpiece of Thomas Jefferson's design for the University of Virginia, was of course built to resemble the Pantheon and the neo-Classical facades of the college buildings seem to be right out of Caesar's time. But the town itself is far more cutting-edge than its architecture. As American regional cuisine has gone upscale over the past decade, Charlottesville has been at the center of many changes, with local chefs updating traditional Southern fare by marrying grits, fried chicken and other standbys with French, Asian and other influences. The town's music scene, too, has served up megastars like the Dave Matthews Band and helped to launch the modern roots-rock wave. Even Virginia wine, once more Burger King than Bordeaux, has caught on. Local vineyards that never used to get invitations to competitions now hold their own with the finest of California or France. Even Jefferson would be proud — the third president succeeded at nearly everything, but he couldn't coax a decent wine out of Virginia's soil. That's a sample. Read about what there is to do in the area of this fascinating city two hours' drive from D.C.
WFTV-Channel 9's Barbara West conducted a satellite interview with Sen. Joe Biden on Thursday. A friend says it's some of the best entertainment he's seen recently. What do you think? West wondered about Sen. Barack Obama's comment, to Joe the Plumber, about spreading the wealth. She quoted Karl Marx and asked how Obama isn't being a Marxist with the "spreading the wealth" comment. "Are you joking?" said Biden, who is Obama's running mate. "No," West said. West later asked Biden about his comments that Obama could be tested early on as president. She wondered if the Delaware senator was saying America's days as the world's leading power were over. "I don't know who's writing your questions," Biden shot back. Biden so disliked West's line of questioning that the Obama campaign canceled a WFTV interview with Jill Biden, the candidate's wife. "This cancellation is non-negotiable, and further opportunities for your station to interview with this campaign are unlikely, at best for the duration of the remaining days until the election," wrote Laura K. McGinnis, Central Florida communications director for the Obama campaign. McGinnis said the Biden cancellation was "a result of her husband's experience yesterday during the satellite interview with Barbara West." It's a universal truth. In cartels there are always cheaters. They solemnly vow to limit their production. The thinking: "That limits our income. We will produce 5% more." One does it; two do it. Here is a living example. OPEC's actual production compared to their production quota. CARPE DIEM: OPEC Cheats: It Overproduces By 500,000 bpd: "OPEC almost always cheats as a group. They over-produce by 500,000 barrels per day (bpd)." See the chart at the link. * Michael Kinsley explains that a "gaffe in Washington" - now known as a Kinsley gaffe - is when a politician slips and tells the truth he was supposed to be hiding. Update. The New York Post analyzes Biden's truthful gaffe. What's particularly disturbing is Biden's Kennedy analogy. For those who don't recall, it was a scant five months after JFK became president that Soviet Premier Nikita Khrushchev took his measure. Kennedy had just bungled the 1961 Bay of Pigs invasion in Cuba, then went off to a summit in Vienna - where Khruschev determined that the rookie chief executive could be had. Two months later, construction began on the Berlin Wall, precipitating a crisis that nearly led to a US-Soviet shooting war in Europe. And 14 months after that came the Cuban Missile Crisis - when nuclear Armageddon was only barely averted. More important: What if he makes the wrong decision - as even Joe Biden suggests he might? After all, Obama was wrong about the troop surge in Iraq. And he was wrong in his initial response to Russia's invasion of Georgia - when he urged the victimized nation to "show restraint." And he was wrong when he said he would gladly sit down unconditionally with people like Hugo Chavez and Mahmoud Ahmadinejad - the very people his own running-mate now says are planning to "test" him. Police are investigating the theft of a beach. A beach! 500 truck loads = 1300 feet of beach. A major resort was planned for the beach, but plans have been put on hold... BBC NEWS The disappearance was deemed so important that the Prime Minister, Bruce Golding, also took an interest in the theft and ordered a report into how 500 truckloads of sand was stolen, transported and presumably sold. He "had good intentions." Lower the standards, so people now unqualified will be able to get loans and buy homes. Who will get the blame? The Australian: We are now sitting in the wreckage of the biggest lending bust the world has ever seen. And there's some merit in trying to pinpoint where it all began. And among the prime suspects is former president Bill Clinton's decision in 1999 to put pressure on lenders to widen the pool of home borrowers in the US. An article in The New York Times on September 30, 1999, laid it all out in what now looks like crystal detail. "In a move that could help increase home ownership rates among minorities and low-income consumers, the Fannie Mae corporation is easing the credit requirements on loans that it will purchase from banks and other lenders," the article, by Steven Holmes, began. "The action, which will begin as a pilot program involving 24 banks in 15 markets, including the New York metropolitan region, will encourage those banks to exchange home mortgages to individuals whose credit is generally not good enough to qualify for conventional loans. Fannie Mae officials say they hope to make it a nationwide program by next spring. "Fannie Mae, the nation's biggest underwriter of home mortgages, has been under increasing pressure from the Clinton administration to expand mortgage loans among low and moderate income people and felt pressure from stock holders to maintain its phenomenal growth in profits." It's like listening to a cockpit voice recorder extracted from the tail of some aircraft wreck. The next paragraph notes that banks and mortgage companies had been pressing Fannie Mae to help them make more loans to so-called sub-prime borrowers. Why? Because such people "can only get loans from finance companies that charge much higher interest rates". Don't they say that the road to Hell is paved with good intentions? That story, whose first three paragraphs were reproduced verbatim, was all about the US government trying to help. On top of that, the banks and mortgage companies thought they were doing the borrowers a favour because otherwise they would have been hit with higher rates. What has happened now, with a million empty houses in the US and no sign of prices bottoming out, is the logical consequence of ill-considered positive discrimination on one side of the ledger. Latinos and African Americans are the biggest minorities who were talked about in the article, as it later made clear, and as we know they now make up a disproportionate number of mortgage defaulters in the US housing market. There have been instances of people who don't like minorities saying "I told you so" about what's happened, but there's a very strong argument that it would have happened to any supposed beneficiary of rule bending. If the lenders had focused on helping Southern good ol' boys, by some quirk, we'd probably be looking at an army of confused and unhappy Southern ex-home owners having to park their rocking chairs on other people's verandas. The iron rule of commerce that was ignored was that money should always be lent to people who are going to be able to pay it back, regardless of any other consideration. HONOLULU — Hawaii is dropping the only state universal child health care program in the country just seven months after it launched. Gov. Linda Lingle's administration cited budget shortfalls and other available health care options for eliminating funding for the program. A state official said families were dropping private coverage so their children would be eligible for the subsidized plan. "People who were already able to afford health care began to stop paying for it so they could get it for free," said Dr. Kenny Fink, the administrator for Med-QUEST at the Department of Human Services. "I don't believe that was the intent of the program." State officials said Thursday they will stop giving health coverage to the 2,000 children enrolled by Nov. 1, but private partner Hawaii Medical Service Association will pay to extend their coverage through the end of the year without government support. It may not have been the intention of the program to provide for those who can afford to provide for themselves, but it works every time. Give something away and people stop paying for it. Duhh! People respond to incentives. If you provide free health care why would those who can afford it pay? Socialism works, I mean fails, every time. It robs people of their learned instinct to provide for themselves. Hat tip to Orbusmax. 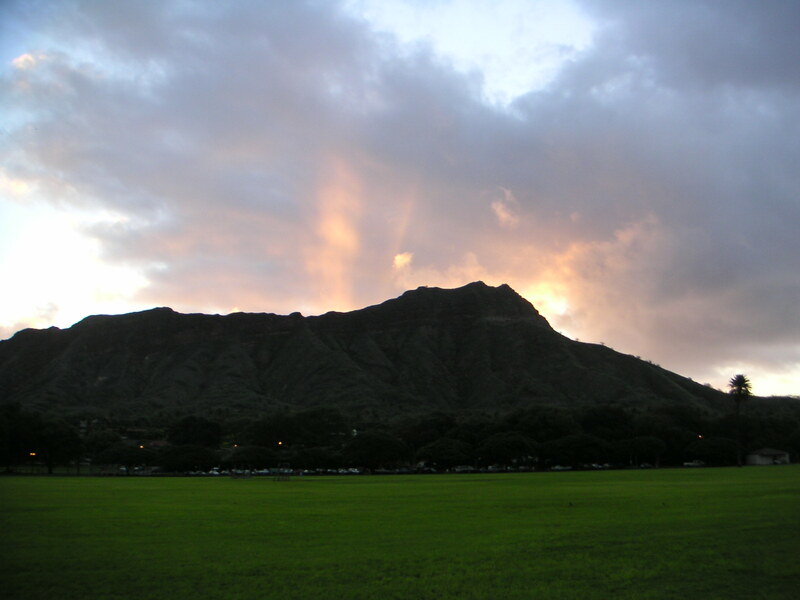 Photo: Diamond Head at sunrise from near the Honolulu Zoo. Initiative I-1000 would make assisted suicide legal. And Oregon's experience tells us that the state would, first, encourage people to use it, then later would almost require it. Old people cost money. In Oregon the state has to balance its budget, but old people are costing a lot of money. So Oregon is denying care to older people and kindly informing them that they can use assisted suicide. But you say the state is not forcing people to commit suicide. But it is by denying them care. But cost is not my main problem. Committing suicide is playing God, literally. No one should be encouraged to end their life before their time. Making it legal surely encourages this crime against God. Coalition Against Assisted Suicide: I-1000 lacks real protection for people suffering from depression and mental illness. 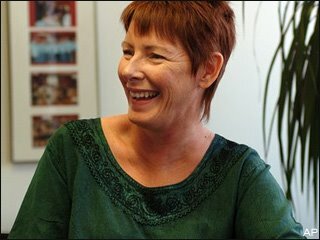 People who are diagnosed with a life-limiting illness often become depressed. This depression is usually temporary and treatable. I-1000 does not require assessment or treatment for depression. [I-1000, Section 6]. Because the waiting period is only 15 days, a suicidal "cry for help" could be met with a bottle of lethal drugs, instead of encouragement and treatment. I-1000 harms spouses and families. Under I-1000, a spouse or family member need not be told about the lethal overdose. [I-1000, Section 8]. Families might never know the truth of how their loved one died. I-1000 endangers vulnerable people. I-1000's backers promote it as being about choice and individualized decision making. But as written, I-1000 does not empower patients. It provides an incentive for health plans to cut costs by steering people toward assisted suicide. I-1000 does not provide adequate safeguards to protect women, minorities, seniors and people with low incomes. What's wrong with Oregon's law? Since Oregon passed its law in 1994, physician-assisted suicide and/or euthanasia proposals have been introduced in 21 states, some multiple times. Not one has passed. In Oregon, the state health plan pays for assisted suicide but doesn't pay for some chemotherapy for people with cancer. I-1000 is similar to -- but more expansive than -- Oregon's problem-filled assisted suicide law. Why I-1000 is more dangerous than Oregon's law. I-1000 is written more broadly than Oregon’s law, has less accountability, more secrecy, and contains significantly less protection for everyone except a small group of pro- assisted suicide doctors and bureaucrats. Where do great economists go when their career is finished? Most to the grave - they do distinguished work all their lives. But not Paul Krugman. After a few decades of break-through work on the importance of international trade he set his accomplishments aside to be the lead attacker for the left. Week after week he tore into every center-right position and person, not with facts and humour, but with acid and misleading. But surely when international trade was under attack he applied his distinguished work to cool the isolationists? No. When during the Democrat debates every candidate renounced North American Free Trade Agreement he was silent. The great economist had ended his work and changed careers. He has been a hack for years. And unaccountable for his errors until the stench grew so strong that even the liberal New York Times had to pull him back a bit. Professor Krugman deserves the Nobel prize for economics. But what happened to the distinguished professor? How did he turn into the liberal hack? Donald Luskin figured it out. Professor Krugman "died." Prior to 2008 the Nobel Prize had never been awarded posthumously. So great minds such as John Maynard Keynes and Fischer Black never received the coveted award. But all that has changed. This year, the prize for economics is going to Paul Krugman, an economist who died a decade ago. To clarify, the person named Paul Krugman, the living and breathing man who will accept the Nobel in Stockholm this December, is merely a public intellectual — a person operating in the same domain as, say, Oprah Winfrey. The living Krugman’s rabidly liberal New York Times column has, for nine years now, traded on the dead Krugman’s reputation as an economist, a reputation that only will be burnished by the award of the Nobel Prize. Yet his column is pure politics, not economics. It is the equivalent of astronomers Mather and Smoot — the 2006 Nobelists in physics — writing on astrology. This living Paul Krugman can’t be the same person as the dead economist. The dead economist wrote eloquently of the supreme importance of globalization and international trade as engines of prosperity. But the living public intellectual remains silent on these subjects when the Democratic party’s nominee for president threatens to abrogate the North American Free Trade Agreement. These days Krugman’s liberal agenda always takes precedence over economic principle. He has described himself as “an unabashed defender of the welfare state.” He has declared, “For me, Sweden of 1980 would be ideal.” He has called Barack Obama’s sweeping plan for socialized medicine “naïve” because it doesn’t contain enough mandates. He has said that “We should be getting 28% of GDP in [tax] revenue,” when the highest level ever collected, even in wartime, is less than 21 percent. Krugman is entitled to such opinions, whether as a public intellectual or an economist. But there have been serious questions about his journalistic integrity — suggestions that the living Krugman has debased and corrupted the very science the dead Krugman did so much to advance. In 1999 Paul Krugman was paid $50,000 by Enron as a consultant on its “advisory board,” and that same year he wrote a glowing article about Enron for Fortune magazine. But he would change his tune. After Enron collapsed in 2001, Krugman wrote several columns excoriating the company. (One featured what may be the most absurd howler in the history of op-ed journalism: “I predict that in the years ahead Enron, not Sept. 11, will come to be seen as the greater turning point in U.S. society.”) In most of these columns Krugman worked hard to link Enron to the Bush administration, and in one he actually blamed Enron’s consultants for the company’s collapse — while neglecting to mention that he, too, had been an Enron consultant. Daniel Okrent, while ombudsman for the New York Times, wrote that “Paul Krugman has the disturbing habit of shaping, slicing and selectively citing numbers.” Indeed. But Krugman’s distortions were so rampant, and his unwillingness to correct them so intransigent, that Okrent — no doubt pressured into service by my Krugman Truth Squad column for NRO — did something about it. Okrent forced the Times op-ed page to adopt for the first time a corrections policy for op-ed columnists. That was in 2004. Later, when Krugman flouted that policy, the Krugman Truth Squad went to work on Okrent’s successor, Byron Calame, who pressed for the adoption of a new, more stringent policy in 2005. The US is not in bad shape compared to 13 countries in Europe. Wow! Look at the chart: the US's circles are small and small is good here. Click on the chart to enlarge it. NYTimes.com: The accompanying chart shows the size of national banking systems relative to their countries’ economies, measured in two ways, and also show how well capitalized the banks appear to be, through the latest reported data. In general, higher figures in any of the graphics indicate increased danger. They do not pretend to show what shape the banks are in, but they do reflect the size of the problem each country would face if its banking system did get into trouble. The first two charts look not at deposits but at short-term debt carried by the banks. The banks usually have long-term debt as well. But by its nature, that debt cannot be withdrawn if worries about a bank’s solvency suddenly increase. They also have deposits, but deposits are less likely to flee, at least if deposit guarantee systems are trusted. Short-term debt, on the other hand, matures within a year and may not be available to a bank that is in trouble. The first comparison — the tinted circles — looks at the size of bank short-term debt as a percentage of a country’s gross domestic product. Such figures are not directly comparable, since one is the total amount of income in a country over a year, and the other is the amount owed by banks that may have to be paid over that year. But the comparisons do show relative sizes. In the United States, the banks have total short-term debt that is equal to 15 percent of G.D.P. But in some countries where banking systems have grown to international proportions, the debt exceeds G.D.P. That is true in Switzerland, Belgium, Iceland and Britain. The second comparison — the open circles — looks at the short-term bank debt in relation to each country’s national debt. Again, the relationship is not direct, because a country may have excellent credit that would enable it to borrow much more, but large numbers still raise questions. “Can they guarantee the deposits if the bank owes 3.5 times the national debt?” asked Bob Prince, the co-chief investment officer of Bridgewater Associates, which provided the data. For countries in the euro zone, there is an additional consideration. They do not have the right to print money. That may also be true for some other banking systems, if the liabilities are primarily in currencies other than their own. Those countries could face special problems if they needed to come up with huge amounts of cash to rescue banks. Finally, the leverage ratio gives a rough indication of how risky a nation’s banking system might be. It is the ratio of total bank assets to the net worth of the bank. That could be misleading if the assets are very safe — government bonds, for example, versus subprime mortgage loans — but in general the higher the ratio the smaller the margin of safety. There again, the United States appears to face a relatively small problem, with an average leverage ratio of 12. The figures range up to 52 in Germany. Theoretically, a 2 percent drop in the value of all German bank assets would wipe out the net worth of the banking system. The chart shows the relative size of each country's problems. The dotted circle represents the denominator: for the filled circle it is GDP; for the hollow circle it is national debt. The B.C. Human Rights Tribunal has decided right-wing humorist Mark Steyn and Maclean's magazine are not racist hate-mongers. How droll. The panel -- chairwoman Heather MacNaughton, Tonie Beharrell and Kurt Neuenfeldt -- released on Friday 37 pages of self-righteous justification for dragging Steyn and the Toronto-based publication through a ridiculous process. The tribunal's week-long kangaroo hearing in June was a waste of public resources and of Rogers Publishing Ltd.'s money, too. This make-believe "human rights" complaint was an attempt by the Canadian Islamic Congress to get publicity by taking on a well-known conservative polemicist and the country's weekly news magazine. It worked. This entire process was an affront to our right to free speech and should send a chill down the spine of every Canadian who wants to express an opinion. What are the rules for the rest of us? On a day trip from Bangkok last year we met a man who works for WWF in Indonesia. I am asking him to explain this. Saturday Night Live spoofs President Bush, Nancy Pelosi, Barney Frank - no spoof needed - the abusers of mortgages. - Two totally unqualified buyers - jobs, etc. Nancy feels their pain and give one of them a hug. - Flippers. They intended to sell in six months at triple the prices, but had to settle for a gain of 10%. - Predatory lenders and George Soros. Posters at the SNL site say this version cut out where the couple thank Barney Frank and congress for blocking congressional oversight, which is true. That's the light-hearted way to explain the subprime mess. Seriously. Here is the article that linked to it: Conservatism Today But there were many people who took out loans that they never intended to repay (when the favorable environment changed). The brilliant SNL parody very accurately displays the Silicon Valley couple that bought condos to "flip" (buying houses and quickly reselling) in a rapidly rising housing market. Unknowingly to the Democrat machine of Fannie and Freddie, these flipper investors were the true catalysts of the meltdown. Without the "flipper investors" it's very likely the Dem's Fannie/Freddie fraud would still be churning unabated. You see, flippers were considered subprime borrowers as well. Those loans were/are grouped in with the low income borrowers. Here's why they are subprime and a demonstration of what happened: Those flipper loans were not conventional loans. The flipper would only need to be asset worthy to qualify for an exotic 0 down ARM (adjustable rate mortgage) loan with no documentation. If they could show a bank account or asset that could potentially cover a default, they could qualify. As long as the market stayed hot and home prices escalated, they were more than OK. The flippers were sought after by the mortgage companies because of the quick turnaround. Light at Huffington Post. Must be a mistake. Of course he clouds his light with bias, but he does show some light. William Bradley: Huffington Post: * America "turns the page" back to a calmer economic moment, enabling cultural issues to come to the fore. Some say it's just bad luck that McCain is running against Obama in a year of economic crisis. Others think it's poetic justice, since he has mainly supported the Bush/Cheney economic policies. Whichever it is, McCain needs a greater sense of calm in the US economy. It could happen. ** The closed credit spigot is opened. Of course, in order for Team McCain to turn the page away from a pervasive sense of economic crisis, the locked credit market must become decidedly unlocked. Right now, the State of California is in deep crisis, with its usual cash-flow issue at this time of year metastasizing in to potential disaster as the usual lenders turn a deaf ear. This is going on everywhere. Of course, if big financial concerns really want a continuance of Republican governance in the White House, they can start lending money. We'll see how they "vote." ** McCain finds an economic initiative ... other than suspending his campaign to pass the Wall Street bailout bill, earmark reform, and big tax breaks for corporations and the rich. The campaign suspension fell flat, as McCain delivered nothing much and ended up debating Obama last week anyway. Earmark reform, well, hardly any voters know what that bit of Potomac-speak means and it's a drop in the bucket of the federal deficit anyway. The tax breaks? "Joe Sixpack" on "Main Street" sitting around his "kitchen table" -- and each of those are egregious cliches used by supposed populists who don't know many people outside their very own elite bubbles -- doesn't relate to big corporate tax breaks. Schwarzenegger had a big infrastructure program that was central to his re-election campaign. Maybe McCain can do something to stimulate the economy. Or push for a health care program. Something that concretely gets things moving or helps "average people," another pol-speak cliche, with their real lives. ** The debate shifts to national security. McCain, of course, sees himself as a wartime president. And we are at war. It's just not war that is presently playing to his 20th century war hero strengths. But a sudden crisis that people relate to -- not Russia's easy war with Georgia, prompted by McCain's rather gullible friend Misha Saakashvili's predictably backfiring baiting of the bear -- could shift things quickly. This would not be triggered by McCain, a man of honor in these areas. It might be triggered by someone abroard who wants McCain elected, for their own purposes. As with Osama bin Laden's very late move in 2004, which helped stop John Kerry's late surge against President Bush. ** The campaign refocuses on Obama. Clearly, the McCain campaign wants the focus all on Obama, his youth, his relative inexperience, his relatively exotic background, his supposed economic, social and geopolitical radicalism, and his associations with Jeremiah Wright, Bill Ayers, etc. This means a highly negative campaign, waged both by McCain and aligned entities. This is tried and true for the Republicans. SHE SAYS: "Today, we sit on a surplus ... We have literal money in the bank. The projected - and I emphasize the word projected - deficit is for 2011." HE SAYS: "It's like having $800 in your checking account, and you owe over $4,000 come January - you're still over $3,000 upside down." THE TRUTH: Gregoire is cherry-picking the slice of truth that sounds best while pooh-poohing the bad part. Rossi is being more truthful - there's a deficit ahead, and the state's savings won't be enough to cover it. Gregoire grudgingly acknowledged some sort of future budget hole when the Legislature adjourned earlier this year. But she continued to answer questions about the deficit by saying the state had a surplus. Lately, she's 'fessed up a little more, but still emphasizes the deficit is not set in stone. That's technically true. The state's balance sheet shows a general fund surplus of about $87 million, with about $440 million in the Rainy Day Fund - a savings account for emergencies - through the 2007-2009 budget. So we do have "money in the bank." But for practical purposes, it's already spent. If she had to write a new budget for the 2009-2011 fiscal year right now, Gregoire would be facing a big deficit. That's because current state spending, if carried forward, would likely cost about $3.2 billion more than Washington is expected to have by the end of the 2011 fiscal year. They also address claims of raising taxes and the balanced budget that Dino Rossi and ex-Governor Gay Locke put together. Three men have been charged with plotting to attack the publisher of a controversial novel dealing with the Prophet Muhammad, British police said Thursday. The three - salesman Abrar Mizra, 22; cab driver Abbas Taj, 30; and Ali Beheshti, 40 - were arrested Saturday near the north London home and office of Martin Rynja, who plans to publish "The Jewel of Medina," police said. They were arrested after a fire broke out at Rynja's building, but police have refused to disclose any details. The men were charged with plotting to endanger life and damage property. Beheshti was also charged with possessing a weapon. All three are due to appear in court Friday. The novel by Sherry Jones, who lives in Spokane, Wash., is a work of historical fiction about Aisha, who according to tradition was 9 when she became the wife of the Prophet Muhammad. She later became a political and military leader in her own right. The book is being released next week. Early to cut short the build up against it! Nigel Calder's father wrote propaganda against the Nazis during World War II, so he knows what it is. And he is a science writer, so he knows a bit about science Nigel Calder at News Letter (UK) Worldwide interest in my quite run-of-the-mill comment, on the need to debate the manmade global warming hypothesis, is pleasing but not surprising. It confirms that my fellow science writers have miscalculated badly. Most readers don't want endless scare stories about climatic doom, accompanied by authoritarian lectures about their carbon footprints. They're hungry for a variety of opinions. Unfortunately only 1% of the huge number of articles on climate change in the posh London newspapers deviate from the official line of the Intergovernmental Panel. That's not my reckoning. It comes from researchers at Oxford University who complain about the more balanced reporting in the not-so-posh papers, with a deviancy rate of 23%. They say it has 'skewed public understanding of human contributions to climate change'. In other words, kindly abandon the journalistic principle that different points of views should be heard on controversial matters, or else a lot of dreadful people out there (you or me) may not truly believe that climate change is their fault. Yes, you've got it. Man-made global warming is just propaganda. My father Ritchie Calder was a science writer too, but during the Second World War he played a leading part in Allied propaganda against Nazi Germany. He told me quite a lot about the tricks, employed in what was then a good cause. Now I watch them being used every day by the global wamers. For example: exaggerate small facts. A brilliant wartime example came when someone in occupied Belgium was chalking V on public walls. He meant V for Vrijheid, or freedom. But London announced that in occupied Europe people were writing V for Victory everywhere. So people listening secretly to the BBC went out and did just that, to annoy the Germans and hearten their neighbours. The polar bears qualify as a similarly astute exaggeration from the global warming camp. Some years ago, a small family of bears was caught in a violent storm, and drowned. That could have happened a hundred or a thousand years ago. But no, the Disneyesque sob story is put about, by Al Gore and others, that bears are drowning because the Arctic ice is melting. Total rubbish, because the polar bears are thriving. But it's dazzling propaganda. Another technique is to hush up unfavourable news. In wartime that can mean not informing even the bereaved relatives if an important warship has sunk without the enemy knowing. Again the polar ice provides a modern parallel. Last year you were told – shock, horror! -- that Arctic sea ice was at its lowest extent since satellite measurements began. What went unreported was that Antarctic sea ice was simultaneously at a record high. The collusion of my fellow journalists in the deception is disturbing. Although the big freeze in Antarctica was plainly announced in a press release from the US weather bureau, NOAA, not a single newspaper in North America or Europe carried this unfavourable story. My Dad's chief opponent was Hitler's propaganda minister Josef Goebbels. Among many meditations on his craft, he wrote, 'The English follow the principle that when you lie, you should lie big, and stick to it.' And of course Goebbels did the same himself – most wickedly in the case of the Jews. One big lie about climate change is that man-made global warming is proven scientifically. Not so. On the contrary, any objective physicist would say that the evidence is strongly against it. The very mechanism for the supposed greenhouse warming, reinforced by that extra CO2, requires tropical air temperatures to rise faster at high altitudes (6 miles above the ground) than they do lower down. Weather balloons that routinely carry thermometers to those heights and beyond have shown no such trend over recent decades. That negative result was an important element of what I had in mind when remarking, in my comment last Monday, that the scientific evidence is far stronger for a rival explanation of climate change. It's the discovery that the Sun controls the cosmic rays that help to make the Earth's clouds. The supporting observations and experiments are explained in simple terms by Dr Henrik Svensmark and me in our book The Chilling Stars. The biggest lie of all, breathtaking in its audacity, is the insistence that mankind's misbehaviour means that global warming is getting worse. The measurements for August 2008 are just in, and they confirm the world is distinctly cooler this year than last. It's fair enough to argue about whether the Earth's temperature has stopped rising, or merely paused, or gone into reverse. But the key fact is that, despite that indisputable increase of CO2 in the air, the Earth is no warmer now than it was 12 years ago.